Book-lover, do you often find yourselves distraught looking for the right next read? A new project in the city: The Blind Book Date will take care of all your worries. A community of book-lovers started this riveting concept of eliminating the human counterpart of a perfect date and leaving in the books. Judging books by the cover? Rather passé, isn’t it. 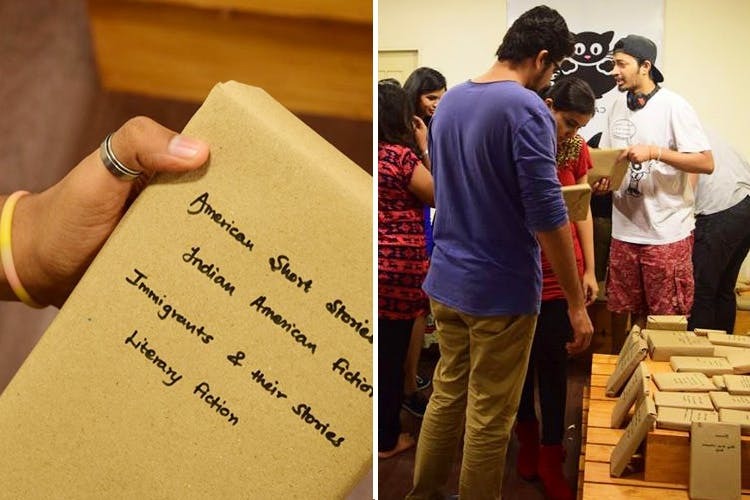 At the events organised by The Blind Book Date, there are books wrapped up in brown paper and the only hint you have is a word or two specifying the genre or hinting at the mood of the book. The rest is up to fate, much like any blind date. Everyone has a date type, even when it comes to books – tall, bark and handsome or thin, paperback and non-fiction. But here what you get is what you take, and in the process you may end up laying your hands on your to-be favourite book, or discovering an unfamiliar author who is brilliant. The books are either donated or bought with the aim of having a good selection of titles that go beyond the chartbusters, so to say. They run across genres, authors – it could be an anthology, a novel, a short story collection or a non-fiction title. They are priced very reasonably at INR 99. Besides the bookstore, each event starts out with an open mic which is open to anything – poetry, one-act plays, discussing your favourite read – anything. Always be in the thick of the plot by trailing their Facebook page here.